In 2012, when the blog was in its infancy, Hand on Heart jewellery was one of the first brands to ask if I would work with them. Based in Cumbria, sisters Amanda and Heather have developed a process to transfer images onto silver, allowing them to make the most gorgeous selection of personalised jewellery. Back then, I was sent some silver cube charms with my kids' photos and handprints on them - which continue to fascinate my kids 2 years on. You can see the post on this link. It explains how you go about making the prints at home with the kit that you're sent out when you make an order. Now this is a company that goes the extra mile with packaging and presentation...just look at the details, starting with this gorgeous card showing the handprints that were used in making the jewellery. Brought a tear to my eye! If you look closely, you can see that the ribbon has been personalised too with my name! and I have to say that I was most looking forward to these as I remembered them from the last time (easily pleased)..clearly 3 of them were all for me, not the kids!! ...and here they are on my bracelet. How gorgeous do they look? I should say, I'm not a full Pandora bracelet kind of girl. I find the bracelet gets too heavy when it's got any more than this on it and I like to show some of the snake-chain. Anyone else find the same? Every time I look at them, my heart melts..they are simply the loveliest little memento of the special people or pets in your life. 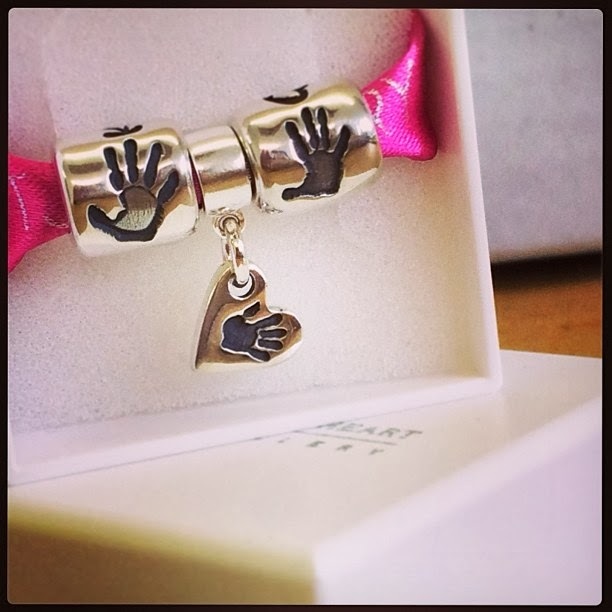 Check out the Hand on Heart Jewellery website on this link - the perfect Valentine's or Mother's Day gift for the woman who has everything and it's nice to know you're supporting a small indigenous company run by two enterprising and talented sisters. Disclaimer - the charms were provided to me free of charge but without obligation to blog. All words and photos (apart from the top photo) are my own. Oh these are lovely Avril, such precious & unique keepsakes that can be passed down onto the children & then their children as good luck charms - I love them! The pandora charms are so cute!